Judging – properly one of the hottest debated topics at a show….. This is a hot topic when it comes to the exhibitor or the general public as everyone is a judge and critic. I have seen some highly dubious decisions as well as being on the end of a couple myself, but at the end of the day it’s only a flower and I am not going to argue and fall out with a judge just because I don’t agree with him. As the saying goes - everyone is a critic!!!! One thing I will say is that I do respect our judges as they stay around so exhibitors can ask questions of them, and at the end of the day we have to respect them and their decision. 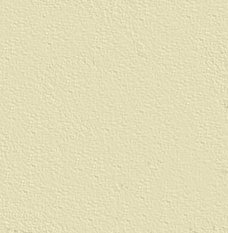 • There are judges who just like solid colours. • There are judges who look for a small fresh clean flower. • You could grow and show varieties that have been hybridised by that judge – As there are a few judges on the judging rota who have hybridised varieties that are still being shown. Basically you are trying to grow varieties for the show bench that might influence a certain judge if the decision is a close run thing. • Pulling warts out – This is either done just to get rid of a wart so you don’t get down pointed for a fault or because the wart is pushing apart the petals causing a “hole” in the flower. • Back in the days when growers provided their own boards, there was one grower who made his board where the centres where less than 9 inches. This gave the illusion that his flowers where bigger than they looked since there was no gaps between the flowers. • Is a centre that is not opened properly (take Tequila Sunrise staged as a cut bloom, most are still not open properly when shown) then how do you know if is hiding a double or faulty centre - worse than a plant with a double centre. • Is a good flower staged poorly for example the centre is looking up and not looking at the judge – worse than a poorly grown one staged perfectly? Why do I want to know this!!! 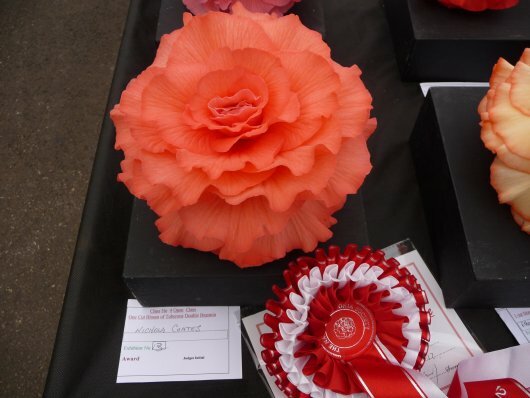 Well let me explain, when I enter a show I want to take my best flowers, however being realistic when you fill all your entries some will have a fault or two. So I would like to know which fault is worse than another. There is a skill and art to achieving 12 9inch flowers on a board. There is only 6 or 7 people that I have seen who can do this, x2 of them are the “Bryce Brothers” and the rest are from Scotland. The problem when you grow a big flower is that all your minor faults are now magnified, so a small fault is now a lot bigger and easier to see. I know people will say that a small fresh flower will beat a poor large flower, to this I agree. But please remember not many people can grow and show flowers at 9 inches across so the petals of each flowers are touching and there are no gaps. Is it not one of the aims of our Society - To promote and encourage the cultivation of Begonias? • I interpret this to mean that we have to try and improve and move forward the culture of the Begonia. • So it is to this end that I think it’s a good thing, as far as I am concerned that we have growers out there who can improve and push the boundaries with regards growing the begonia whether it’s a Pot Plant (like Stephen Jones), Cut Blooms (like Ian Donaldson & Kennedy McQuiston) and Species (like Vincent Potts, Samuel & Elisabeth Kennedy). However a small fresh flower should not beat an average large flower let alone a good large flower, because if everyone could grow a 9inch flower they would. • that means the pool to recruit new judges who we can be trained up is getting smaller. • If we don’t somehow encourage other members to grow and exhibit then in the not so near future there will be no begonia shows. • We will then become a society with just a website and bulletin. 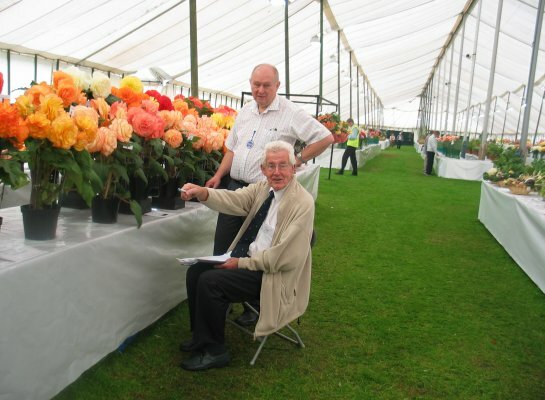 • We could look at the way the Scottish Begonia Society runs with regards having a large committee, where everyone wants to join into help – You just have to visit Ayr flower show to see what I mean. • I personally cannot see the point in falling out over a flower!!!!! Because that’s basically what has happened over the last few years. • Next step joining the ever decreasing circle of speakers and starting to do Talks and Presentations in 2016 (already in progress) – looking forward to that with some trepidation. • Carry on my travels both North & South of the borders to meetings and visits to meet other growers and have a good rummage through there set ups. • Put myself forward for election onto the Society Committee and help that way. • Maybe I will ask to become a judge one day – now that is a scary thought…. It’s not what the National Begonia Society can do for you, but what you can do for the National Begonia Society.